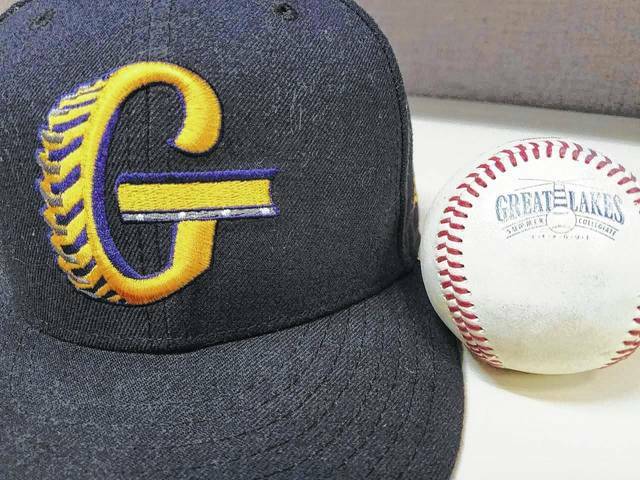 GALION — The Galion Graders were back at it again on Wednesday evening against the Southern Ohio Copperheads at Heddleson Field in Heise Park, looking to stay alive in Southern Division playoff contention after dropping Tuesday’s contest by a final of 6-4. Unfortunately for the home team, the Copperheads would bounce back in the middle and closing innings to earn a 7-5 victory. With that win, Southern Ohio improves to 26-10 and currently sit just one game back of the division leading Cincinnati Steam (28-10). Galion falls below .500 at 18-19 with the loss and now trail the Hamilton Joes (19-19) by half a game for the final playoff spot in the division. The Graders came out of the gate strong in the opening inning. Galion’s defense and starting pitcher Creek Miller shutdown the Copperheads in order in the top of the first before coming up to the plate. After Eric Wentz struck out to start the game, Todd Sekowski followed with a groundout to second. With two outs, Jacob Reimold stepped in to the batter’s box and delivered his eighth homer of the season deep and out of left field. Up 1-0 early and still with two outs, Matthew Detering dug in and followed suit, blasting a home run out of dead center field to stretch the Graders’ lead to 2-0. Juan De La Cruz followed with a single but would be stranded at first as his brother, Jose De La Cruz smacked a long flyout to left. Southern Ohio saw their first two batters of the second put out before Joe Stewart connected on a double. Stewart would put himself closer to home by swiping third but would be stranded there. In Galion’s portion of the second, catcher Cole Andrews led-off the inning with a bomb to center field for his second homer of the season to put the Graders up 3-0. The top of the third saw the Copperheads stranding another runner at third after a Scott Combs lead-off single. For the first time in the bottom of the third, Southern Ohio got the home team’s batters to go down in order as the squads headed into the fourth with Galion still up 3-0. In that fourth inning however, the visitors would finally get to Miller, starting with Ray Zuberer reaching after being plunked by the Galion hurler. Blaine Crim followed that by delivering a single and the Copperheads had runners at first and second with nobody down. Blake Holub would change that however with just one swing of his bat, belting a three-run home run to knot the score at three runs apiece. Southern Ohio would not be finished though as Stewart reached via a single but he would be erased on a Collin Minor 6-4 fielder’s choice. After a flyout gave the road squad two outs and a runner still at first, Joey Weisenseel reached on a two-base error by Galion third baseman Reimold. Minor would score on the play and Weisenseel would be left at third but the damage was done and Southern Ohio took the lead from Galion at 4-3. Jose reached via a walk and proceeded to steal second in the Graders’ portion of the fourth and made it over to third after a dropped third strike saw Austin Hathaway taking first. Both Jose and Hathaway would be stranded on the bases. A pair of two-out singles by Crim and Holub would get the Copperheads aboard in the fifth but they would both be left on the base path when the inning came to a conclusion. Galion couldn’t get anything going in the bottom of the fifth as they were shutdown in order. In the sixth inning, both teams would go 1-2-3 as the contest entered the seventh with Southern Ohio still up 4-3. Galion held the base runners to a minimum in the top of the seventh to keep the game in tact. Andrews led-off the seventh with a double and moved on over to third after a Hathaway groundout to first. Wentz would plate Andrews on a two-out single to knot the game up at four apiece. Sekowski would knock a single and Reimold would walk to load the bases for the home team. Detering went down swinging to end the frame with the bases juice, squandering three potential runs. Southern Ohio and Holub led-off the eighth with a quick two-bagger before Stewart knocked a single to put runners at the corners with nobody out. Minor grounded out to Christopher Jordan at shortstop but Holub crossed the plate on the play to put the Copperheads back up; 5-4. With Stewart now at second and two outs, Weisenseel ripped a double to score Stewart and add an insurance run for the visitors. The Graders would go down in order again in the bottom of the eighth to send action into the ninth with the visitors holding a 6-4 advantage. In that final frame, Southern Ohio would score another run to stretch their lead to three runs at 7-4. Hathaway would flyout to center to begin the Galion ninth and was followed by a strike out swinging by pinch-hitter Vince Donato. Down to their final out, Wentz stepped in and breathed life into the Graders’ chances with a double. Sekowski followed Wentz with a double of his own and Galion now trailed by two at 7-5. Reimold would flyout to end the game however as the home team dropped their second game in a row and their fifth in their last seven games. Miller would take the loss for Galion, tossing the first 7⅔ innings for the home team while allowing 10 hits and six runs (five earned). Miller would walk a pair and strike out two. Gavin Lewis worked the remainder of the contest, allowing just one hit and one unearned run while walking one and fanning one. Offensive statistics for the Graders on Wednesday were: Team- 9/36, 3-HR, 3-2B, 3-1B, 5R, 5RBI, 7LOB, 3BB, 8K; Andrews- HR, 2B, 2R, RBI; Wentz- 1B, 2B, R, RBI; Sekowski- 1B, 2B, RBI; Reimold- HR, R, RBI; Detering- HR, R, RBI and Juan De La Cruz- 1B. On the evening, the Copperheads recorded their seven runs on 11 hits despite stranding nine runners on the base path. Southern Ohio was spotless in the field of play while Galion committed, what turned out to be, two costly errors. The Graders will now hit the road for two very important games against the Hamilton Joes on Thursday and Friday before heading north to play the Lake Erie Monarchs on their home field on Saturday. Galion will be back at Heddleson on Sunday, July 29 for their final game of the regular season in which they host the Monarchs at 4:05 p.m.